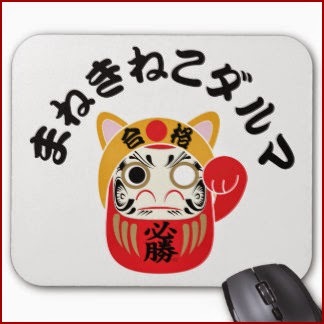 Our Daruma san, on a mousepad, woven in the traditional quarters of Nishijin, a suburb of Kyoto! The roots of Kyoto Nishijin weaving go back some 1,200 years to the founding of Heian-kyo, mode to manage the production of textiles for court nobles, and employed weavers to produce luxury fabrics. By the middle of the Heian Period(794-1192), however, these state-owned textile operations were on the decline, and more and more weavers were choosing to set up independent workshops. New weaving techniques were arriving from Sung Dynasty China at this time, which the Nishijin weavers were quick to absorb. 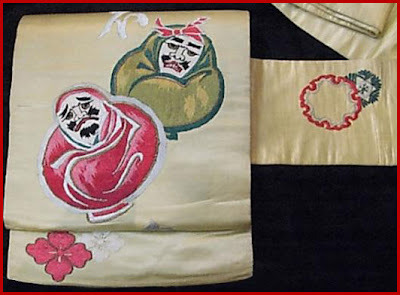 Toward the end of the Edo Period, Japan suffered a succession of disastrous harvests, leading to a sharp decline in the demand for luxury fabrics. And when Japan's capital was moved from Kyoto to Tokyo in 1869, Nishijin weaving seemed threatened with extinction. While these events certainly enfeebled the weaving industry, not to mention the entire Kyoto economy, the Nishijin weavers showed an amazing resilience and spirit in preserving their craft. Observers were sent to Europe to study the textile industry there, and advanced Western weaving technology and equipment were introduced. By the 1890's, only 20years after the shift of the capital, the Nishijin weavers had fully adapted modern technology to their ancient art, and the industry began to grow again, along with Japan's new capitalist economy. Through adopting modern technology, the Nishijin weavers were able to create a stable business in inexpensive machine-woven fabrics for everyday use that supported the production of the elaborate and luxurious hand-woven fabrics that are the purest expression of the Nishijin style. Today, standing in the center of Nishijin, the clacking of looms can be heard all around. The vitality of this district is a testament to the pride and dedication of Nishijin weavers through the ages, and symbolic of the importa nt place that Nishijin occupies in the hearts of Kyoto people. The museum regularly holds weaving demonstrations at its ground-floor hand looms, which use the Jacquard system of perforated cards for weaving. One of the most interesting things to do here is attend the free Kimono Fashion Show, held six or seven times daily, showcasing kimono that change with the seasons. At Nishijin, each of the seasons is represented. Spring sings of the scent of flowers. ... ... Summer speaks of days gone by. ... ... Autumn indulges herself in simplicity and serenity. ... ... Winter applies a delicate dusting of snow to the patchwork of roof tiles. No one is inferior to any other in this world, lavish with beauty.Savor contentment with the elegance of Nishijin, conceived in the midst of history and tradition. The processes of Nishijin weaving. The Nishijin style of weaving uses yarn dyeing, in which yarns of various colors are woven to make patterns. 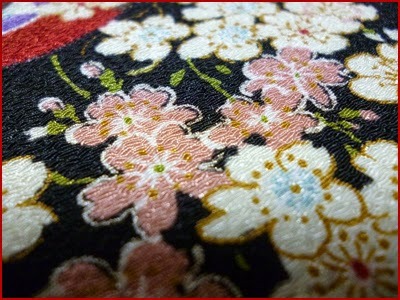 This technique is both time-consuming and labor intensive compared to other techniques, but it is indispensable for creating the elaborate and gorgeous designs required for kimono fabric. Yarn dyeing consists of many intermediate steps, each of which, in the Nishijin tradition, is undertaken by experienced specialists. While preserving its traditional skills, however, the industry has been quick to adopt such innovations as process mechanization and computer control to help reduce costs. 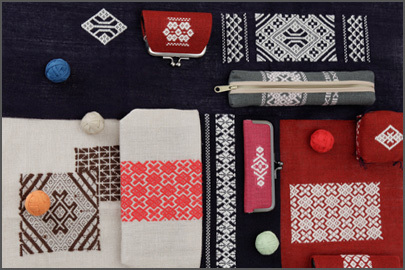 In this way, the modern Nishijin industry continues to provide beautiful hand-woven fabrics, while bringing the pleasure of Nishijin textiles to many more people than ever before. Although little known outside Japan until about 1986, traditional Japanese embroidery has been an integral part of Japan's culture for over a thousand years. Now refined and perfected far beyond its origins, traditional Japanese embroidery is a unique reflection of a millennium of consensus of thought. Drawing from earlier periods of history, the design motifs and colour schemes have meanings of their own. Appropriate designs and colours are selected according to the age of the wearer, the season of use, or to symbolize traditional themes, legends and classical Japanese literature. 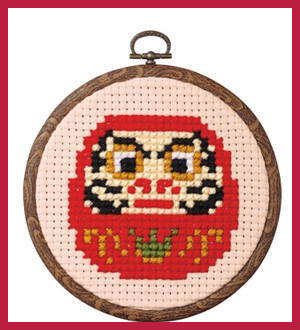 Today this tradition is handed down through the Kurenai-Kai community in Japan, the Japanese Embroidery Center: Kurenai-Kai Ltd. in Atlanta, and Japanese Embroidery UK. Kurenai-Kai in Japan was founded by the late Master Iwao Saito. Together with tutors in Britain, America, Canada, New Zealand and Australia, they have begun the work of conveying the knowledge and love of this beautiful art to other countries. 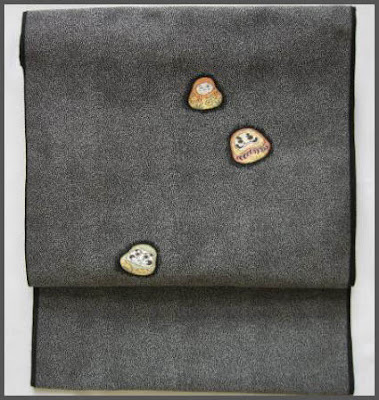 A group of Daruma embroidered in Silk. This looks like a humorous version of the Seven Gods of Good Luck. The knot has a size of about 30 x 15 cm. The whole sash is 335 cm long. and many other motives, like the beckoning cat, Fukusuke or a cute dog toy. 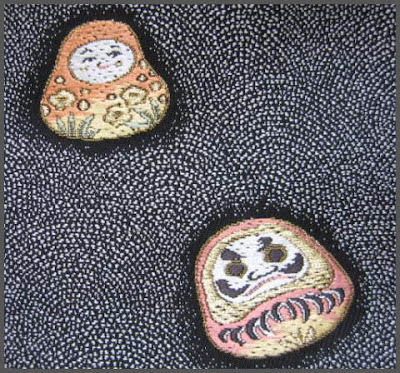 People often refer to Sashiko embroidery as Japanese embroidery. And while both terms have the word embroidery in them, as a native of Japan and instructor of traditional Sashiko design, I would like to take the time to explain the distinction between the two. 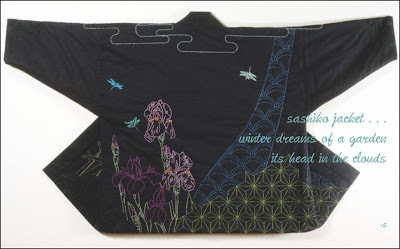 Sashiko embroidery is a very old and classical form of hand sewing using simple running stitches. The Japanese word Sashiko means "little stabs". Sashiko was born from the necessity of conserving and repairing garments at a time when cloth was not widely available to farmers and fishermen. Japanese embroidery (nihon shishu in Japanese) is an embroidery technique that goes back more than one thousand years. It uses intricate patterning, silken and golden threads, and traditional symbolic motifs worked on fine silk fabrics. 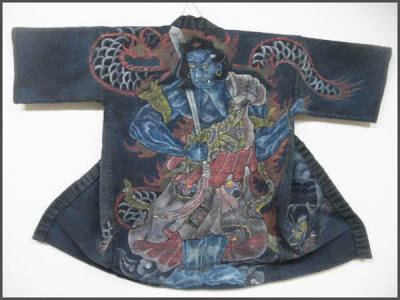 In its early stages, and in contrast to the functional aspect of Sashiko embroidery, Japanese embroidery was reserved for decorating items used during religious ceremonies. sashiko jacket . . .
. Honjo Sashiko 本荘 刺し子 quilted coat with embroydery .
. Aomori Folk Art - 青森県　. cotton threads became easier to obtain, and the modest designs of Kogin-zashi gradually started to vary. In the Meiji Period (1868-1912), the class system was abolished and the ban on cotton used was lifted. Cotton thread became even easier to procure, and women from farming families began to compete over the beauty of the designs they could embroider. Over time, Kogin-zashi came to be used not only for working clothes, but for festive attire as well, and became crucial to women’s wedding preparations. Kogin-zashi has changed in many ways, such as using stencils instead of designs passed down through the generations, and using a wide variety of colors for the design instead of solely relying on indigo and white. However, the traditional techniques are still cherished to this day, with their high quality rigorously maintained. Be sure to enjoy these warm designs, unique to the cold climate of Aomori Prefecture. 1- All Edo Shishu embroidery is done by hand. 2- The following types of thread are used: silk, genuine gold thread, genuine silver thread, flattened gold, flattened silver, powdered gold, powdered silver, and urishiito (lacquered thread). 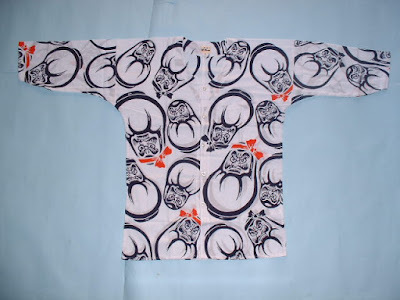 3- The textiles used in Edo Shishu are woven silks and hemps. 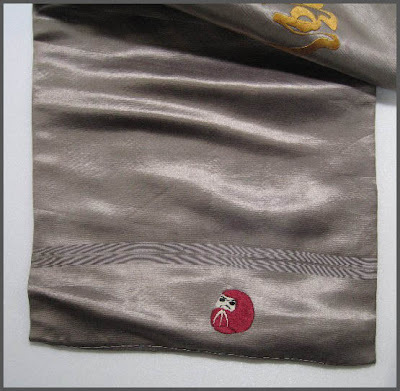 Silk thread (flat silk, twisted silk), genuine gold thread, genuine silver thread, flattened gold, flattened silver, silk textiles, hemp textiles. Shishu embroidery commenced during the Asuka Period (592-710). 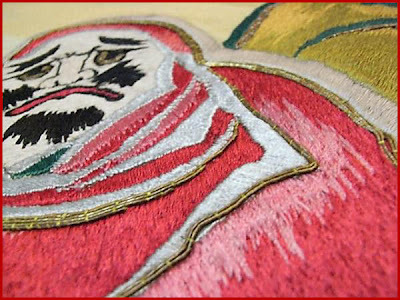 Buddhism had been introduced from China at around this time, and along with religious iconography such as gilt statues, there were a number of Shubutsu 繍仏 (Buddhist tapestries) created. These items are believed to represent the roots of the Shishu tradition in Japan. 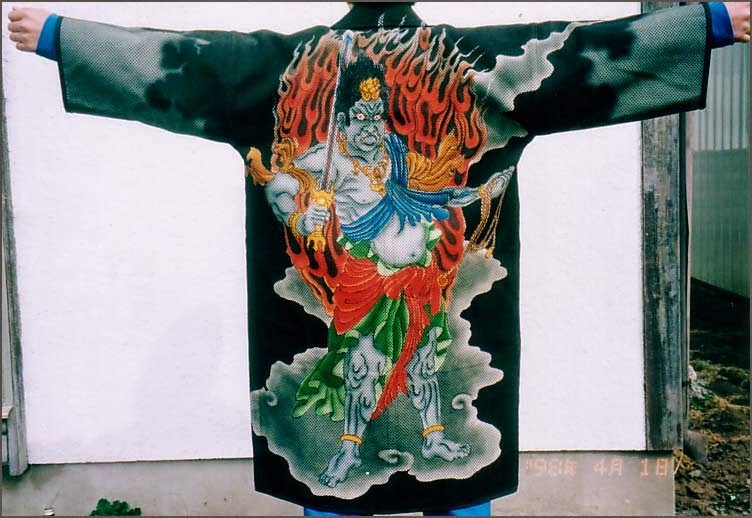 The oldest remaining example of such works is the "Tenjukoku Mandara Shucho" 天寿国曼荼羅繍帳 (kept at the Chugu-ji Temple in Nara Prefecture). This is a tapestry said to have been commissioned by Empress Suiko (554-628), and subsequently embroidered by the ladies of her court to commemorate the death of Prince Shotoku (572-622). As court life evolved further in the Heian Period (approx. 794-1185), Shishu techniques started to appear in the ceremonial court clothing of both men and women. This led to the development of competition at court based on flamboyant fashion. Further Shishu evolution occurred in the Azuchi-Momoyama Period (approx. 1573-1603). Whereas previously the mainstream was patterns achieved by needlework alone, many Shishu works from this period combined embroidery with dyed textiles for decorative effect. Against a backcloth of peace and tranquility in the middle Edo Period, townspeople's social status increased concurrent to their economic power. 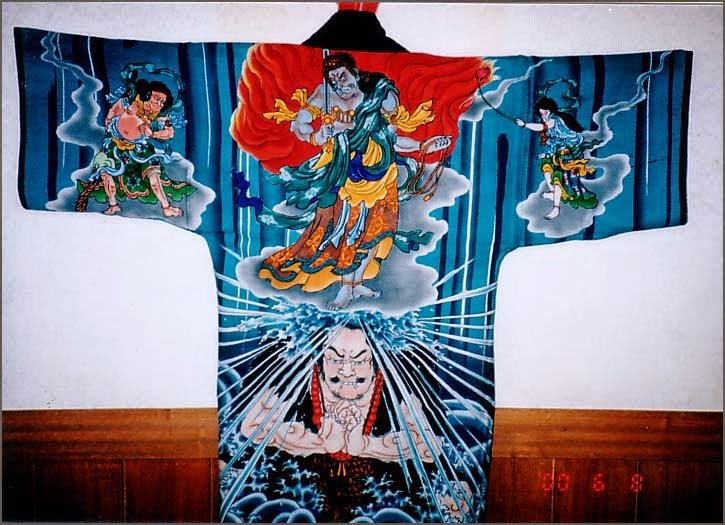 Some of their number tired of a perceived simplicity of decoration, and this led to the creation of dazzling kimono that combined numerous dyeing and Shishu techniques. Because such kimono began to attract exorbitant prices, the Shogunate introduced sumptuary laws and sought to strengthen its prosecution of offenders. 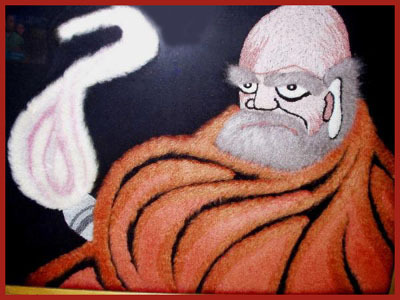 However, prosperity in the Shishu trade continued along with a flourishing of Edo culture. At the time, Shishu craftsmen carried the titles of nuihakushi (embroidery masters) or nuimonoshi 縫箔師・縫物師 (masters of embroidered goods). 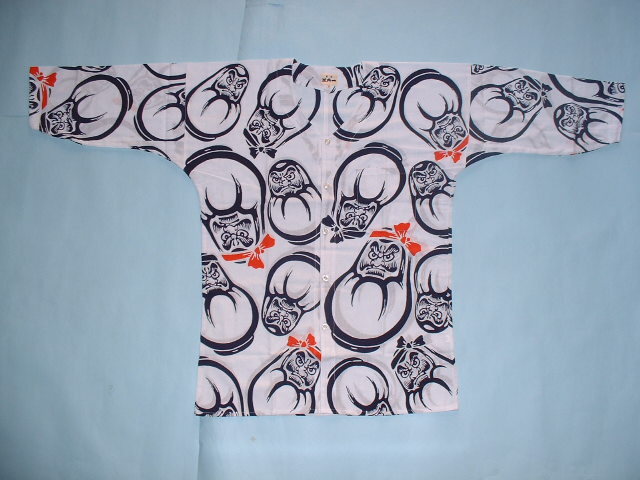 Furthermore, there were distinct styles associated with the Kyoto, Kaga and Edo regions of Japan. Concerning needlework placement in Edo Shishu, designs came to be laid out so that their interspacing could be enjoyed. Shishu craftsmen consider both the thickness and ply of threads. Using processes that resemble the drawing up of precision plans, they focus their attention on preparing threads and working in numerous different colors. 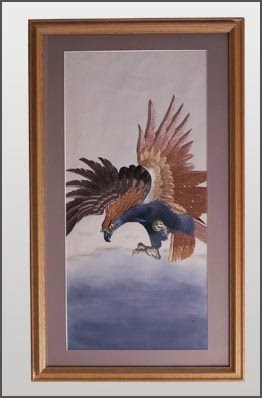 Behind the magnificent finished works of Shishu, there is a mundane task involving great perseverance. Armed with just a needle and thread, the craftsman's job is all about how much life they can breathe into the underlying textiles; with the intricate needlework patterns taking shape literally one stitch at a time. ***** . Weaving and the Tanabata Star Festival .